The intent of the S-RAMP specification is to outline a data model and protocol designed to define how a repository should store and manipulate artifacts. The foundation document defines the former, while various protocol binding documents define the latter. 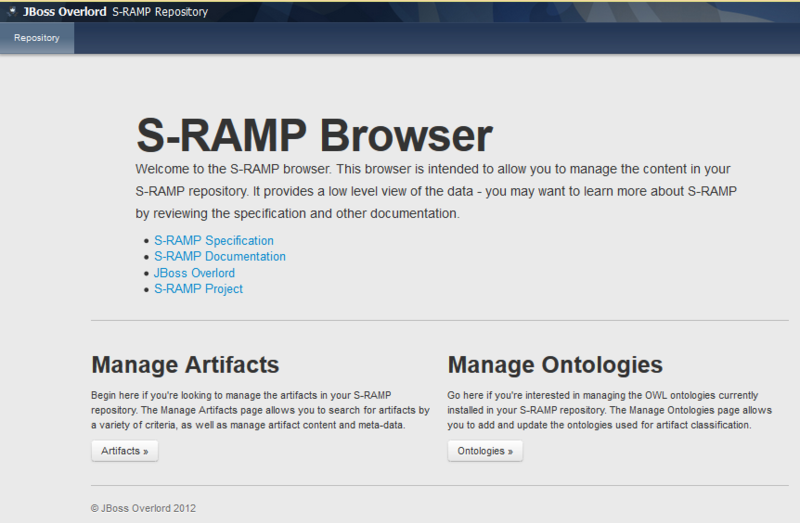 Version 1 of the S-RAMP specification includes a single, Atom based protocol binding. This section of the guide describes the highlights of the Atom API. For more information on the S-RAMP Atom API, see the S-RAMP Atom Binding document. There are two basic types of artifacts from the protocol standpoint: document style artifacts (those artifacts that are based on files/binary content) and logical (direct instantiation) artifacts. In the case of a document-style artifact, the client must POST the binary content to the correct Atom Endpoint. In the case of a direct artifact (no document content) the client must POST an Atom Entry containing an S-RAMP artifact XML entity to the appropriate endpoint. The server will respond with an Atom Entry containing the full meta data of the newly created artifact (if successful). A client can update the meta data (properties, classifiers, relationships) by performing a PUT request to the artifact’s endpoint. The artifact’s endpoint can be found either by querying for the artifact or as part of the returned Atom Entry returned when the artifact was created. Not surprisingly, an artifact can be deleted by a client by performing a DELETE request to the artifact’s endpoint. startPage: The page to start from. startIndex: The index number to start from. count: The number of artifacts to return. orderBy: The sort order to use when creating the feed. ascending: The sort direction to use when creating the feed. propertyName: Additional custom property to return for each artifact in the feed. This property can be included multiple times. When retrieving a simple model or type feed, the client must issue a GET request to the appropriate model or type endpoint. In order to retrieve the full meta data for an artifact, the client must issue a GET request to the appropriate artifact endpoint. This is necessary after a query or feed, when only the summary information is available. The summary information found in a feed or query response contains the UUID of the artifact, as well as a URL to the endpoint needed to retrieve the full artifact details. A powerful additional feature of the S-RAMP API is the batch processing function. The batch processing endpoint allows the client to POST an S-RAMP package, which can contain multiple Atom Entries and binary files. The package allows a client to add, update, and delete multiple artifacts in a single batch. The format of an S-RAMP package archive is described further in the S-RAMP Atom Binding document (Section 2.3.5.2.2.1 - no I’m not kidding, that’s really the section). Overlord S-RAMP also provides a Java based client library that consumers can use to integrate their own applications with an S-RAMP compliant server. As mentioned, the Overlord S-RAMP implementation also provides a Java client library that can be used to integrate with S-RAMP compliant servers. This section of the guide describes how to use this library. The service document contains a workspace for each of the S-RAMP data models supported by the server. Publishes a new artifact into the repository.